There are serious battles being fought in the field of criminal law as we speak, and most of California is completely unaware of what is happening. This battle is waging especially strong in San Diego, where Wallin & Klarich attorneys are on the front lines. The battle is between criminal defense lawyers who are committed to representing their clients to the fullest extent, and district attorneys. Recently in San Diego, Wallin & Klarich attorney Daniel Lough learned that calls made between lawyers and defendants in custody have been being taped and that District Attorneys have access to each and every tape. This news has spread throughout legal field quickly as more and more people become dismayed at the behavior of the Sheriff’s office and the District Attorney’s office. But that is just the tip of the iceberg. 2008 has been an important year in this battle we have been waging to protect the rights of all criminal defendants in San Diego and California as a whole. The San Diego Public Defender’s office has also been productive in this fight. The District Attorneys office are finding out if defendants in custody have been visiting with experts, psychologists, psychiatrists, DNA experts, blood experts, and any other kind of expert witness. In fact, the DAs have been finding every single person a defendant in custody speaks with and when. The DA’s have been finding out about any kind of evidence your lawyers requests from an outside source, and they’ve been finding out what the evidence is and where it came from. The DA’s have been finding out even whether or not a defense lawyer is looking for more evidence. Obviously, the DA’s have gained an upper hand when they learn the defense lawyer’s strategies before trial. Creative lawyers will not let this happen. Several cases from 2008 have come down and helping defense lawyers defend their clients’ rights to privacy, rights to assistance from a competent lawyer, rights to due process, etc. In San Diego, where the DA’s will stop at nothing to gain the upper hand, a defendant needs to make sure he has a lawyer who is used to the battlefield and who knows how to fight. The specific issues are too lengthy and complex to discuss here, but only the most creative, resourceful, and knowledgeable lawyers will be able to prevail for their clients. That is where Wallin & Klarich comes in. As a firm that specializes in the defense of criminal defendants charged with felonies or misdemeanors, we can ensure that you keep the upper hand. If you or a loved one has been accused of a crime, you should speak to a lawyer who knows the law, the most recent law, and who will serve your needs. 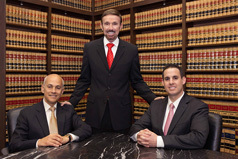 Call Wallin & Klarich to speak to just the kind of lawyer you need, at 888-749-0034, or contact us via our website at www.wklaw.com.